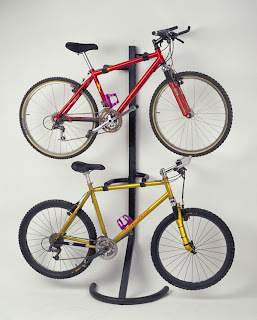 StoreYourBoard Blog: Bicycle Storage Rack | What is Best Bike Storage Solution for You? Bicycle Storage Rack | What is Best Bike Storage Solution for You? Though bikes can be sleek and stylish, they can be clunky objects that take over your garage, basement, mudroom or apartment. With all the various bike storage racks available, it is hard to find the perfect one for your living condition. Here is a list of bicycle racks that attach to the wall or ceiling, and that can be free standing with no structural support. 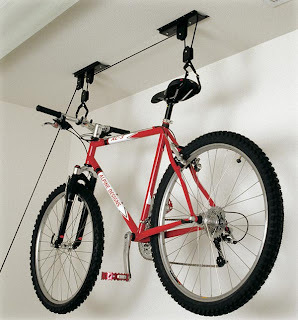 Ceiling Bike Rack – A good way to store your bike if space is extra limited. The ceiling bike rack hoists the bike to the ceiling and with a special locking mechanism prevents falling. This rack keeps space needed for objects that are floor bound and is not only for the garage; try hitching it to the ceiling of your mudroom or storage area. Don’t worry about not being tall or strong enough to remove the bike from the ceiling. This ceiling bike rack lowers the attached bike by a reachable and easy to use rope. 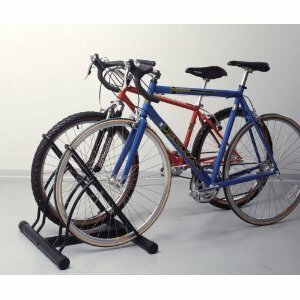 Floor Bike Stand – The floor bike stand is a good way to store your bike without worrying about putting nails in the wall or the ceiling. It’s a great way to store your bike if you live in an apartment building and there are no outside bike racks. 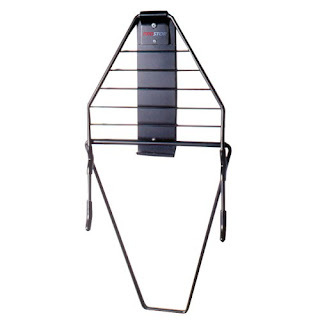 The floor bike stand provides easy removal and placement. Simply roll the bike in to and out of the rack—it’s so easy a child could do it. Free Standing Bike Rack – This is another bike storage rack that does not need attachment to a wall. However, if you worry about the security of the rack there is an option to order the rack with a wall mounting kit. By holding two bikes horizontal to one another, the free standing bike rack frees space in front of the rack to fit your storing needs. Only weighing 20 lbs, the free standing bike rack is easily movable to find the perfect spot for your bike. 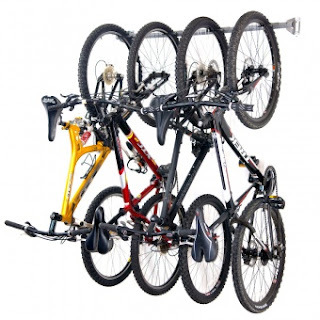 Folding Bike Rack – One of the best ways to eliminate excess use of space when storing your bike is the folding bike rack. The folding bike rack securely grips the bike rack closely to the wall to provide a compact storing experience. This rack also contains a shelf allowing the cyclist to store their bike helmet and gear. Both types of rack, wall mounted and free standing, provide the necessary attributes to keeping a clean and clutter free room. 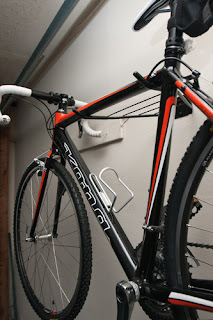 Each rack is relatively easy to assemble and manage as each of the bikes can be removed and placed easily on the rack.